When I lived back East, one of the joys of the early spring was the small border of hyacinths in my front yard. They were the first flowering plant to lift themselves from the soil after the difficult winters, frequently appearing through a crust of late snow. Their unassuming blue flowers were not merely an announcement that winter was on the wane; they were the shock troops of spring, staking out the flower garden boldly for the rest of the greenery to catch up. Like those garden hyacinths, Jeannie Roberts’ poetry serves the same purpose. As the winter days slowly move toward their end, I can expect a book of poems to stake out a place in nature, brightening as the days become longer. 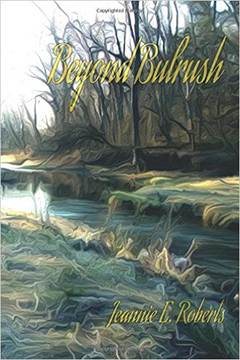 This year she has presented us with Beyond Bulrush, a collection of poems that sparkle like the surface of a Wisconsin brook. In my last review of her poems, I took pains to keep from categorizing her as a “Nature Poet”. I believe such labels can be limiting to a poet, but what does one do with one who uses words like “Lepidoptera” and “bryophyte” in her poems? Surely, the language of Biology, which she uses so deftly in her work, would pretty much define her as such. In Beyond Bulrush Ms. Roberts takes a step beyond flora and fauna, expanding her world with memories and outstanding poetic technique. The entire poem is comprised of 20 short lines yet the tenor of this work is dazzling. The punctuation works well with the short lines to set a lively rhythm; as the reader is swept through the poem the internal rhyme and slant rhyme leap up to engage the ear. By the end of the poem, we come to a stop accompanied by the poet who brought us “on a walk where you choose/to love the life that you lead.” The poet has constructed an image of sheer delight that she shares with the reader. Poet and reader share in the gratitude alluded to in the title. These two poems, when taken together sound like the epitaphs in Edgar Lee Master’s “Spoon River Anthology”. The story is bittersweet and Fate has a greater hand in their lives than they anticipated. Jeannie Roberts is not your typical “Nature Poet”. Yes, she writes charmingly about woodlands and the creatures therein but she can turn on a dime and explore the grief of a loved ones passing, her grandmother’s porch swing and even Swedish flooring. She is not a Nature Poet because Nature is too small a subject for her. She examines everything around her with the precision of a Biologist using the finely honed tools of a master poet. This is a fine book and well worth the time spent reading and pondering its poems. Hopefully, it is a harbinger of an early spring.